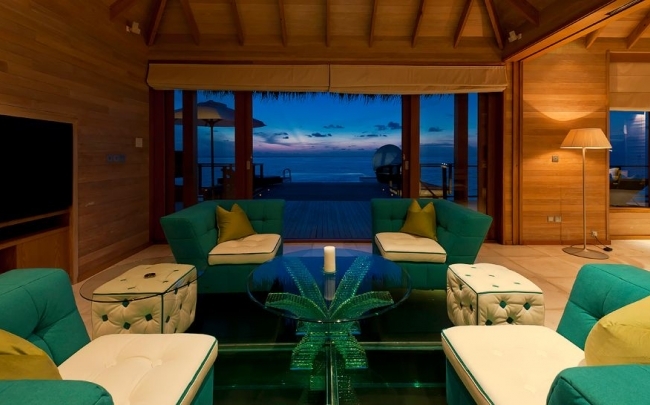 Beach Villas have combined an elegant blend of luxury and natural harmony in a contemporary Maldivian style. With 150 square metres of indoor/outdoor living space. Facilities: Private terrace, telephone, TV with satellite connection, CD/DVD player, tea/coffee facilities, mini-bar, walk-in wardrobe, bath in outdoor pavilion and outdoor shower. Offering over 300 square metres of private living space with a light and airy bedroom and living area; a private courtyard with fountain; glorious outdoor shower and separate bathing pavilion. Facilities: Telephone, TV with satellite connection, CD/DVD player, tea/coffee facilities, mini-bar, walk-in wardrobe. 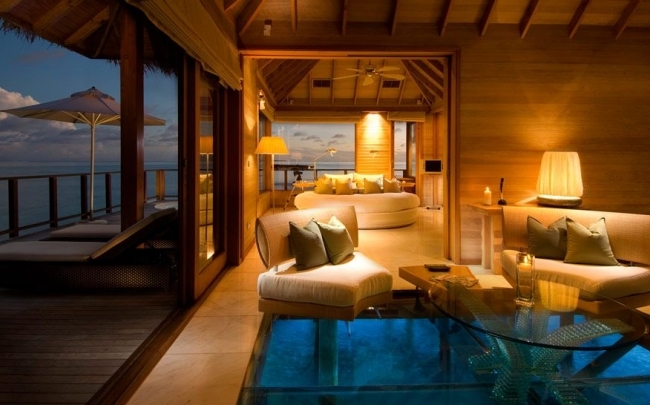 Private plunge pool; a kidney-shaped pool or a lap pool all set in lush gardens leading to the beach. 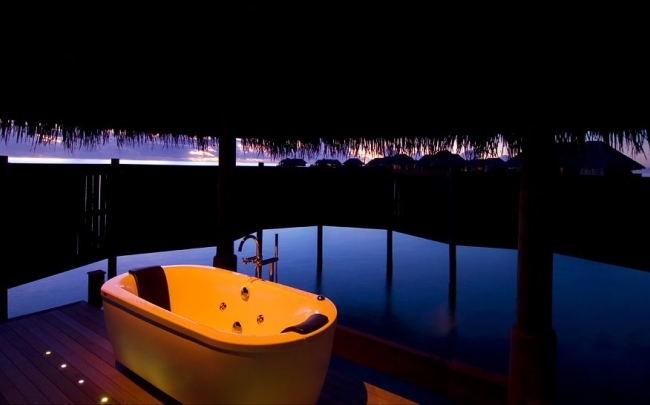 The 28 Water Villas are set on stilts over the lagoon and boast ocean-view baths and private, teak sun-terraces with access to the lagoon and beach. They are self-contained and their wooden interiors and oak floors evoke the best of the tropics. Amid the beautiful furnishings, guests will find an array of luxurious amenities. Facilities: private sun deck, steps into the ocean, flat screen LCD TV, DVD player, CD player with iPod connection, portable telephone with IDD, wireless internet access, espresso machine and tea-making facilities, minibar, separate shower and bath, satellite, Bulgari toiletries. Discover island life in the stunning Superior Water Villas, each set on stilts above the alluring azure waters of the Indian Ocean. Facilities: Private sun deck, steps into the ocean, flat screen LCD TV, portable telephone with IDD, WIFI, espresso machine and tea-making facilities, minibar, separate shower and bath, satellite, Bulgari toiletries, private Jacuzzi on the terrace, 23-inch flat-screen DVD player and CD player with surround-sound theater system. 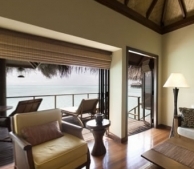 The spacious Deluxe Water Villas offer a true taste of luxury and design. Built to the same high standards as a Superior Water Villa but on a larger scale, they have a romantic four-poster bed, Jacuzzi, large sitting area, dressing room and a magnificent freestanding ocean-view bath to complete the array of luxurious amenities, which create the perfect retreat. 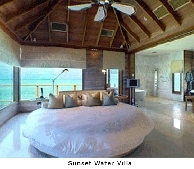 Facilities: Same as a Superior Water Villa plus: larger room size, large Jacuzzi on the deck, stunning ocean-view bath tub. The two Premier Water Villas sit on stilts in their own private part of the lagoon and boast luxury combined with modern technology. Bathing becomes a pleasure in the huge corner Jacuzzi with inbuilt TV screen, while the separate walk-in shower offers a myriad waterfall options. 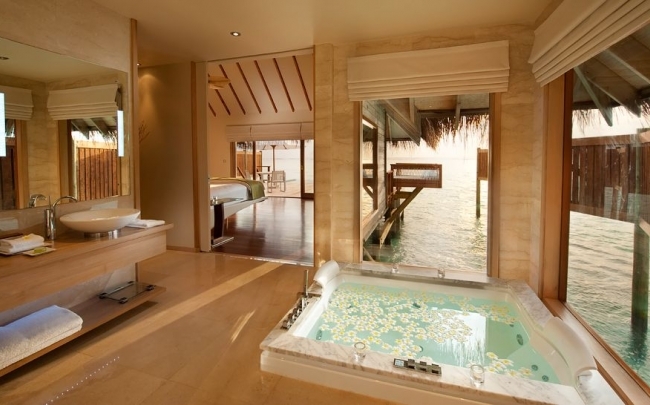 There´s a second Jacuzzi on the private deck overlooking the ocean. In the room is a magnificent flat-screen satellite TV and DVD player. Facilities: Same as a Deluxe Water Villa plus: Jacuzzi with inbuilt TV in the bathroom, Pharo shower, personal butler service. 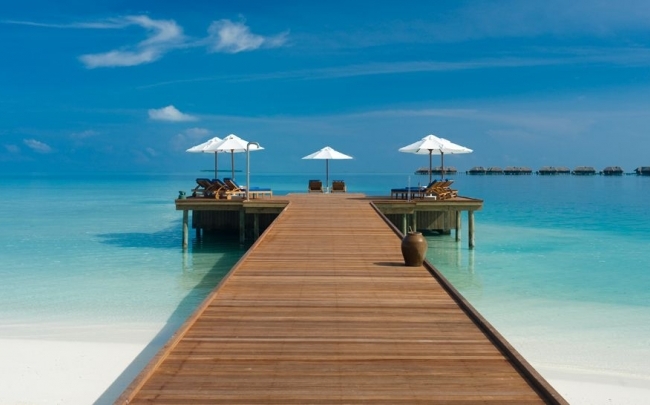 The pinnacle of luxury, the two Sunset Water Villas offer 250 square metres of unadulterated bliss. With breathtaking features such as a glass-floored living room, 24-hour butler, plasma TV with satellite, cable and Bose Surround Theatre System, a Jacuzzi on the sundeck., and a circular rotating bed in the master bedroom (one of two bedrooms in each villa). 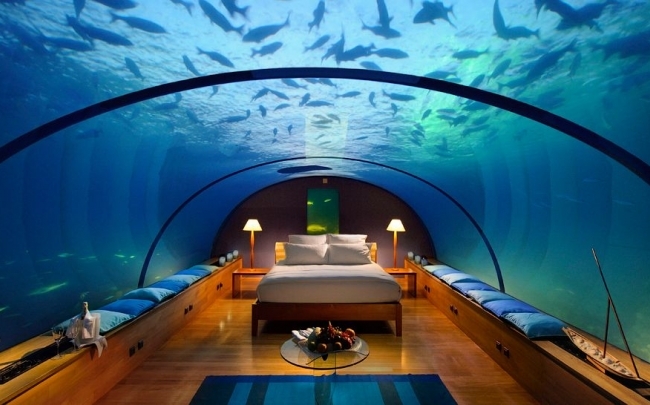 The Sunset Water Villas represent the most luxurious over-water accommodation available in the Indian Ocean. Facilities: 2-bedroomed villa, standing in a private part of the lagoon, glassfloored living room, TV satellite throughout, DVD and CD player,kitchen, private butler service, circular, rotating bed in the master bedroom, Philippe Starck fittings, Jacuzzi on the sundeck, infinity pool on the sundeck. 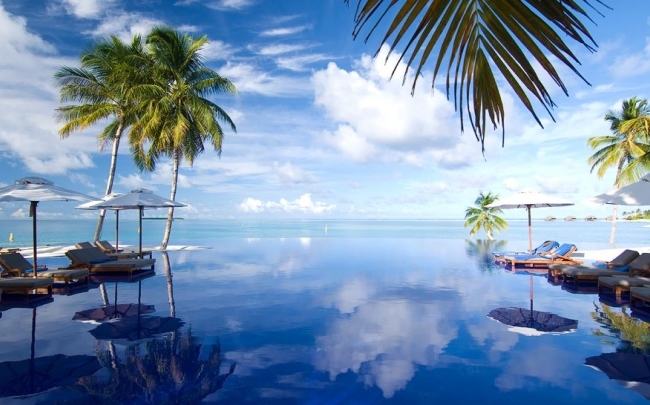 The 21 Spa Water Villas are an integral part of the stunning Spa Retreat. Each spacious villa, built on stilts over the ocean, boasts entrancing ocean views, a private treatment room, a magnificent over-sized bath tub and a sun deck. 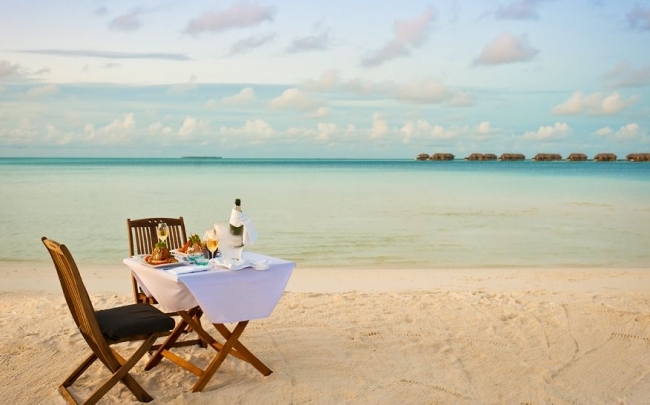 Guests dine at Mandhoo Spa Restaurant, and are entitled to daily treatments in the Spa Retreat, fresh juices and fruit, lifestyle consultations and use of the gym. Facilities: Part of the Spa Retreat, these villas offer magnificent overwater accommodation with CD player, satellite TV, DVD player, two sundecks, outdoor/indoor bathtub (separate shower and bath), ocean views from all windows, private treatment room for massages, portable telephone with IDD, second line and voicemail, wireless internet access, espresso machine and tea-making facilities, ´spa´ minibar with organic goodies, and Molton Brown toiletries.